Scleroderma, also known as systemic sclerosis, is a chronic connective tissue disease, generally classified as an autoimmune rheumatic disease, that affects over 300,000 Americans. Caused by the body’s auto-immune system triggering inflammation and other tissue abnormalities, symptoms of scleroderma include hardened or thickened skin that looks shiny and smooth, ulceration of fingertips, small red spots on the face and chest, painful or swollen joints and muscle weakness. Although it differs from person to person, scleroderma can be very serious, with an untreated case leading to acute kidney disease, pulmonary hypertension, lung inflammation and gastrointestinal problems. Currently, there is no medical treatment that has been clearly proven to stop, or reverse, the key symptom of skin thickening and hardening and medications that have proven helpful in treating other autoimmune diseases, such as rheumatoid arthritis and lupus, have proved largely ineffective at treating people with scleroderma. While some of the more damaging symptoms of scleroderma can be effectively treated, massage is proving to be an increasingly effective factor in allowing scleroderma patients to improve their quality of life. Massage therapy is at its most effective in the early stages of scleroderma. As the disease causes a hardening of the patient’s tissues, either locally or throughout the body’s systems, massage therapy is of limited use during for later stage sufferers of scleroderma. An early diagnosis of scleroderma, which the tissue is still reasonably supple, allows for the most effective use of massage therapy. Massage, as part of a multimodal approach to scleroderma treatment, helps to increase blood circulation, manage pain and could potentially delay the worsening of symptoms. 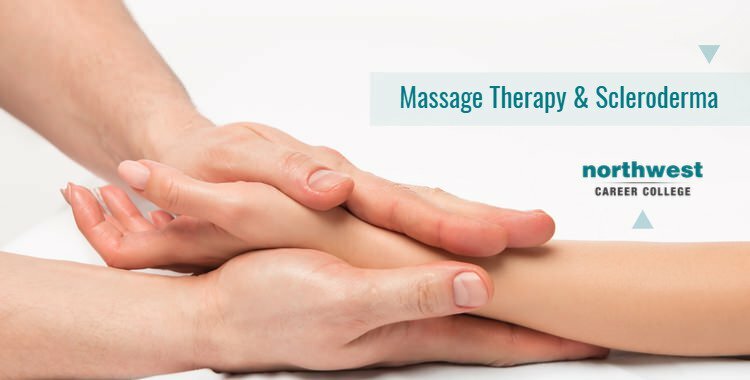 Massage techniques for scleroderma as similar to those used for fibromyalgia, combining aspects of deep tissue massage with gentle and tactile approach. As with any medical condition, patient engagement with their massage therapy is highly important. Massage therapists should be in constant communication with their patient, working with them to gauge the effectiveness of the therapy and what level of pain they are experiencing. With its ability to aid in increased circulation and joint function, massage therapy can be an important part of allowing scleroderma patients to deal with the disease, helping them to live active and rewarding lives.